Stan was the co-founder in 1971 of the Los Angeles Crips gang. In 1981 he was convicted of murdering four people during two robberies and sentenced to death row at San Quentin State Prison. Stan deeply regrets his gang involvement but has always maintained his innocence of these crimes. The U.S. Supreme Court has now rejected Tookie's appeal to investigate the racism and discrimination at the heart of his case, as well as Tookie's innocence issues. One issue highlighted the fact that the prosecutor in Tookie's original case removed three African-American jurors from the jury. During Stan's trial, this prosecutor made racially-coded remarks during his closing argument, comparing Stan during the trial to a Bengal tiger in the zoo and stating that a black community - South Central Los Angeles - was equivalent to the natural "habitat" of a Bengal Tiger. Amicus Brief Filed By ACLU On Tookie's BehalfThe ACLU (American Civil Liberties Union), the national NAACP (National Association for the Advancement of Colored People) and several other civil rights groups have filed an amicus (Friend of the Court) brief urging the Ninth U.S. Circuit Court of Appeals to consider racist injustices in jury selection during Tookie's 1981 trial. (click here to read the story) Court Recommends Clemency For TookieRead about the ruling against Tookie on September 10, 2002, by the 9th U.S. Circuit Court of Appeals -- and the Court's recommendation to spare his life. Harvard University announced over the weekend that from now on undergraduate students from low-income families will pay no tuition. In making the announcement, Harvard's president Lawrence H. Summers said, "When only 10 percent of the students in elite higher education come from families in lower half of the income distribution, we are not doing enough. We are not doing enough in bringing elite higher education to the lower half of the income distribution." If you know of a family earning less than $40,000 a year with an honor student graduating from high school soon, Harvard University wants to pay the tuition. The prestigious university recently announced that from now on undergraduate students from low-income families can go to Harvard for free...no tuition and no student loans! They offer reduced tuition if you earn between 40,000 and 60,000. To find out more about Harvard offering free tuition for families making less than $40,000 a year visit Harvard's financial aid website at: http://www.fao.fas.harvard.edu/ or call the school's financial aid office at (617) 495-1581. Among all the trophies Wendell Scott won in his racing career, there is one that will forever be his legacy to the sport he loved. It isn't much to look at, just some off-color wood with no plaque or varnish or glitzy, gimmicky metalwork. It pales in comparison to the gleaming, brightly polished trophies is sits among. But that piece of wood, battered and beaten and sorry compared to the others, is the symbol of Scott's greatest day as a racing driver. It was Dec. 1, 1963, the day he won a NASCAR Grand National event in Jacksonville, Fla. Scott remains to this day the only black driver to have won a Grand National (now Nextel Cup) Series event in NASCAR's 58-year history. During the 42 years since Scott earned his victory -- which, given the times and the area in which it occurred was not celebrated as victories always have been, in Victory Lane with a trophy queen and photographers -- no black driver has even been close to accomplishing the same feat. Randy Bethea shocked the NASCAR world in 1973 by knocking Darrell Waltrip off the pole at the Nashville Fairgrounds Speedway, but that was in a Late Model Sportsman event, not Grand National. Willy T. Ribbs, one of the finest road racers in the world, tried out a stock car at Daytona but never qualified for the 500. That's pretty much been it, in terms of black names in Cup racing on the driving side since Scott won at Jacksonville in 1963. Bill Lester has driven in Craftsman Truck races since 2000. Scott, who died in 1990, was from Danville, Va., just inside the state line from North Carolina. It was an area rich in history for stock car racers, and also an area where it was not unheard of to run illegal whiskey from town to town in souped-up cars. Scott was a taxi driver who graduated to running moonshine and eventually to racing stock cars. For any of those jobs, one had to be a master mechanic and a pretty nifty driver. In 1959, at the age of 38, Scott won the Virginia State Sportsman championship. Two years later, Scott was able to field a car for the Grand National Series. In nearly 500 Grand National races, he was in the top 10 an amazing 147 times. Considering what Scott had to go through to compete in those Grand National races, it is even more amazing. The South in the early 1960s was still in the grips of Jim Crow, Bull Conner and the sort of segregation that we today know only through history books. Even on the day he won in Jacksonville, the pervasive attitude of Southern society at the time prevented him from receiving his due. "Everybody in the place knew I had won the race," he said years later, "but the promoters and NASCAR officials didn't want me out there kissing any beauty queens or accepting any awards." Despite racing on a budget that made shoestrings seem expensive, Scott made it work. In 1966, he was a career-best sixth in the points. Through it all, he held his own and competed nose-to-nose with many of the legends whose achievements the present-day NASCAR is built upon. His driving career ended for all intents and purposes in 1973, when he sustained three cracked ribs, a lacerated arm and a cracked pelvis in a massive 21-car pileup at Talladega Superspeedway. Ramo Stott's blown engine nine laps into the race that day caused the crash, and Scott's Mercury was credited with 55th place (out of 60 starters). He died Dec. 22, 1990, after a long battle with spinal cancer, some 27 years and 21 days after the biggest victory of his career. He was later elected to the International Motor Sports Hall of Fame, located, ironically, in Talladega, Ala.
"I'm so glad we never gave up," said Scott's widow Mary. "When Ned Jarrett and all of those old drivers came to Scott's funeral, they told us he had the respect of all the drivers. I'd say all of those older guys learned to like him and respect him. They knew he was a genuine person and he stood for what he believed. He didn't give up." Scott's son, Franklin, said that his father had earned his respect by competing with the best in the business and never giving an inch despite the fact that he was at a huge disadvantage in both finances and resources. As his father's crew chief, Franklin didn't get to see his dad win at Jacksonville, having stayed behind to play in a high school football game that weekend. "I'll never forget it," Franklin Scott said. "I was playing football that weekend and I was home and got on the bus and a guy on the bus, a friend of mine who was a real joker, said, 'Your dad won a race today.' I said, 'Yeah, sure.' And he said, 'No, your old man won today.' I still didn't believe him." Wendell had won the race, by two laps over Buck Baker, but NASCAR waved the checkered flag over Baker and awarded him the trophy. Hours later, NASCAR officials told him he really did win the race. "My dad went off then," Franklin Scott said. "He said, 'Give me my damn money.' Buck got the real trophy. The thing we got was junk. They gave us a trophy about a month later at Savannah. But it wasn't the real thing." While it didn't make much sense to Franklin at the time, it did later. It was racism, pure and simple. "I guess it all was just a sign of the times." he said. "The opportunity for a black man to race just wasn't there. He overcame many hurdles and he never let it faze him to the point where it made him hostile. I don't know how he was able to do that. It was difficult for me when I would see a lot of the things I wouldn't understand why my daddy didn't put them in the wall. I thought he was afraid. He wasn't afraid ... he was thinking about the next race." While there were many similar incidents over the years, one stands out to Franklin. In 1962, Jack Smith watched Wendell shatter his track record at Savannah, Ga., in a car Scott bought from Jarrett. Smith marched over to Scott's pit and told him that he would drive right through Scott's car that night in the race. Scott finished second to Jarrett that night, and though Smith didn't apologize to Scott, Joe Weatherly did. "Joe Weatherly came to our pits after the race," Franklin remembered. "He said, 'Wendell, I just came to apologize for the rest of the stupid SOBs.' "
According to Franklin Scott, Smith kept at it until one day Wendell had enough. "He [Smith] had wrecked us up at Winston-Salem and my daddy had had it with him," Franklin recalled. "On the pace lap he pulled up beside Daddy and started pointing his finger at him. We didn't know it but Daddy had his gun with him and he pulled it out and pointed the gun back. We never had trouble with Jack again." It is hard to imagine something like that happening today. Because of men like Wendell Scott and Randy Bethea, black drivers are getting a chance to prove themselves in the arena of competition. NASCAR and corporate America have awakened to the fact that there are more Wendell Scotts out there, and they are bound and determined to find them. Bethea's story is similar to Scott's, although he was still racing as late as 2003. The now-56-year-old Bethea attended a race with an older brother and was hooked, and soon began to work toward racing as a career. In 1967, he bought his first stock car. Three years later, he was the Tennessee State Champion. Henderson, who as a youngster was taken to the Fairgrounds track by his father, hopes to race professionally some day. Can he make it? That's how Bethea did it, and how Scott first crossed the race barrier in NASCAR racing. All of the gains made in recent years can be traced to a single date: Dec. 1, 1963 -- when Wendell Scott won the biggest race of his life. Antwone Quenton Fisher was born in prison to a teenaged mother. He became a ward of the state of Ohio and was placed in foster care immediately. He spent two years in a loving foster home, but when it was apparent that the foster mother had become too attached to Antwone, deeming a reunion with his birth mother too difficult for the child, he was placed in a foster home where he would suffer twelve years of abuse at the hands of the foster family. He survived the cruelties of foster care and the brutalities of homelessness and set on a course of healing after joining the United States Navy where he served his country for eleven years. Currently, Antwone works in Hollywood as a director, screenwriter, author and film producer. New York Times Best Seller Finding Fish a Memoir, is the inspiring story of his incredible life's journey. 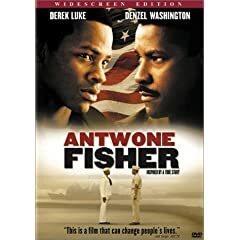 The film, Antwone Fisher, based on Fisher's life and written by Fisher himself reflects on Fisher's life as a sailor in the United States Navy and as a child growing up as a ward of the State of Ohio, living in Cleveland. Through his collection of poetry titled, Who Will Cry For The Little Boy? a National Best Seller and now one of the best selling books of poetry of all time, Fisher reveals the inner truths that took him from a tumultuous childhood to the man he is today. Among Fisher's many achievements and accolades include the Christopher Award for the film Antwone Fisher, the Humanitas Prize, for writer and for co-producer of Antwone Fisher, an NAACP Image Award for the film Antwone Fisher, Screenwriter of the year Award 2002 from the National Association of Theater Owners, Nominated for Best Original Screenplay from the Writers Guild of American west for the film Antwone Fisher, The National Angel in Adoption Award for for 2002 and in 2005 Antwone was announced to be one of the top 100 people in Hollywood you need to know, by Fade in Magazine "The First Word in Film". In May, 2003, in recognition of his professional achievements as an author, producer, poet and screenwriter, his loyalty to his community, his personal triumphs and his indomitable spirt it was conferred upon him the degree of Doctor of Humane Letters by Cleveland State University.